ATDB • View topic - Will trolleybuses return? Skexis wrote: Trolley buses are not much use as they can't go anywhere that isn't wired. Yes they can as they store power in batteries, the Auckland ones are capable of this but the distance is not that great. 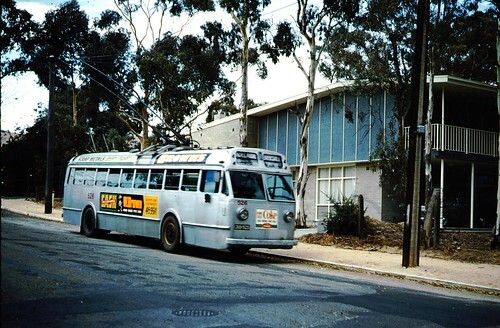 Heardy_101 wrote: I always thought about Trolley Buses on the O-Bahn. But the question with that is can a Trolley bus get to the same speeds on the O-Bahn. Heardy_101 wrote: Because if you're going to go to that length then may as well have a tram instead. As much as it pains me to say this because I love the tangle of the overhead wires, but with modern technology we are steadily moving away from a need to have overhead. Sydney's new tram extension is an example of that. Actually this is changing rapidly and they can move quite significant lengths off-wire. For example, there is a trial route in Prague where the buses are only running about 10% of the route on wire. These are basically dynamically-charged electric buses that recharge on the move on short sections of wire plus a section of overhead at the terminus and overnight charging. I believe the O Bahn was built with stanchion bases for trolleybuses. The Inspector wrote: Yes they can as they store power in batteries, the Auckland ones are capable of this but the distance is not that great. But they can charge while on the move, while a diesel or gas bus can go further on each tank but only be refueled while stationary and only in depots. Even in the city, it is still electrified, with ground level power supply. This is a type of ground level power supply that only works for trams, not for buses. Last edited by Myrtone on Thu Oct 25, 2018 5:18 pm, edited 1 time in total. Check out the Save Wellington trolleybus group. They note that no bus can be more electric than a trolleybus and that Wellington is converting trolleybuses to battery buses to achieve what an overhead electric system already achieved. And Wellington no longer has trolleybuses but is buying new fully electric buses - so that worked well didn't it? 1whoknows wrote: And Wellington no longer has trolleybuses but is buying new fully electric buses - so that worked well didn't it? Trolleybuses ARE fully electric buses! Furthermore they drew their power in Wellington mainly from renewable geothermal energy, not from the environmentally detrimental process of manufacturing and ultimate disposal of batteries. Wellington is simply an cynical exercise in political and industry dishonesty. Imagine if we removed overhead wires from our tramway network and converted our tram fleet to battery power just to achieve what that overhead electric system already did. That small group of people who are offended by the sight of a length of wire up in the air would be elated. Don't come to my city if you are offended by that. bus companies in Europe / US charge the batteries of their electric buses at terminals. An interesting update on Wellington trolleybus. They've now got one trial bus fully converted to battery. moa999 wrote: An interesting update on Wellington trolleybus. "Fully-electric vehicles". What weasel words - they were already fully-electric vehicles ffs! Well, this was predictable. I wonder if anyone sees anything American about the idea that battery buses are the future. Think of Silicon Valley. Also, consider how much talk about battery electric vehicles and miracle batteries is coming out of the radical and freedom conscious U.S.A. Furthermore, straight electric traction has always been more common in Europe that it currently is in the 'States. A lot more tram and trolleybus systems survive in Europe than in, well, the same country that gave the world the personal computer and the internet. If any of you understand what I am trying to say. That doesn't seem to have anything to do with trolleybuses. Okay, there hasn't been any activity for a while. The fact is that Adelaide's tramway network has overhead wires throughout and has recently been expanded, presumably with more lines projected, all electrified throughout. But yet there are no plans for the return of trolleybuses, is this seen by others here as a double standard? Myrtone wrote: Okay, there hasn't been any activity for a while. The fact is that Adelaide's tramway network has overhead wires throughout and has recently been expanded, presumably with more lines projected, all electrified throughout. But yet there are no plans for the return of trolleybuses, is this seen by others here as a double standard? trolley buses just aren't needed and won't bring anything extra to the city's transit requirements to justify the time and expensive to bring back trolley buses. It would just be a case of putting overhead wires along current bus routes and running trolleybuses along them instead of diesel or C.N.G buses. If trolleybuses aren't needed, are overhead wires needed on new tram extension as opposed to new trams using battery power on these new extensions. Then put trolley poles on the trailer to recharge the batteries. That will get rid of all the messy junction and crossover wiring and leave just relatively short runs of straight wiring for recharging without downtime lost in stopping for recharge. The bus in this image has a trailer already of course and it's put to use carrying passengers! As long as wires are cheaper to install than rails, then maybe use overhead power by default as is common in cities that still have trolleybuses.